Summer Veggies Are My Salvation! This summer is hot. For real. Its been a weird week- kind of busy but no energy and feeling blah. I get the sense everyone is feeling it, not just me. The two things that have kept me going this week (besides Grant and the doggers), though, are… fresh summer veggies and good music! 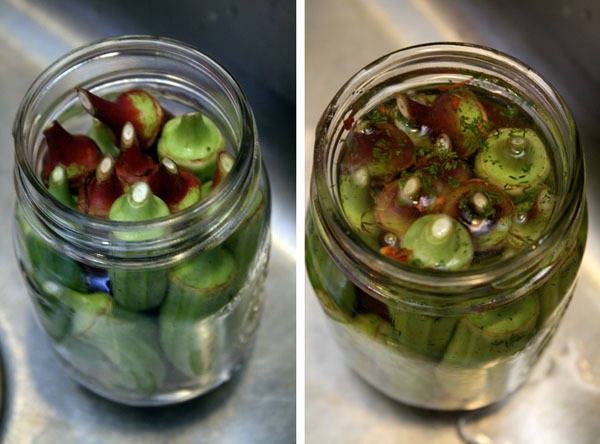 We sterilized the jars in boiling water, put the garlic, peppers, dill in, stuffed them with washed okra, and then poured the water/vinegar mixture (which had been heated with salt and sugar) over top and sealed them up. The jars are in the refrigerator now and in one week, we can see how they taste. I was a little sad that the red okra lost most of its color when we poured the warm mixture over it but they still look beautiful! I cleaned and steamed the turnips for about 5 minutes and then added the beans. I steamed them for another 5 minutes maybe and then threw them in an iron skillet with a little olive oil and the butter on medium high heat to get them a little browned. I did not cook them long, maybe 5-10 minutes (both were still firm and crisp, the turnips seemed very potato-like). While these were cooking, I chopped the cherry tomatoes, green pepper and the basil and mixed it together with olive oil, the balsamic vinegar, and sea salt to make a little relish. I poured the turnips and beans in a bowl and topped with the relish. It was so simple yet tasted so fresh and delicious. We ate it with some baked lemon garlic chicken Grant concocted and it was perfect together. The next day, I had the leftover turnips & beans cold and it made the perfect healthy salad. Grant put some in a wrap with turkey. Ahhh… summer at its best! That is all I have for now. But, I have lots and lots of fresh berries in the fridge and I plan to make many pies this weekend. The first Red Barn Round-Up of the season is on Sunday- the perfect mix of Southern cookin’ and old school country music! Those pickles are beautiful! And I am interested in trying those turnips – I never buy those either, but you’ve inspired me. Well… after I return from roaming the south! See you soon, sweets! That pickled okra should be ready by the time of your arrival! Hurry on up and get here! 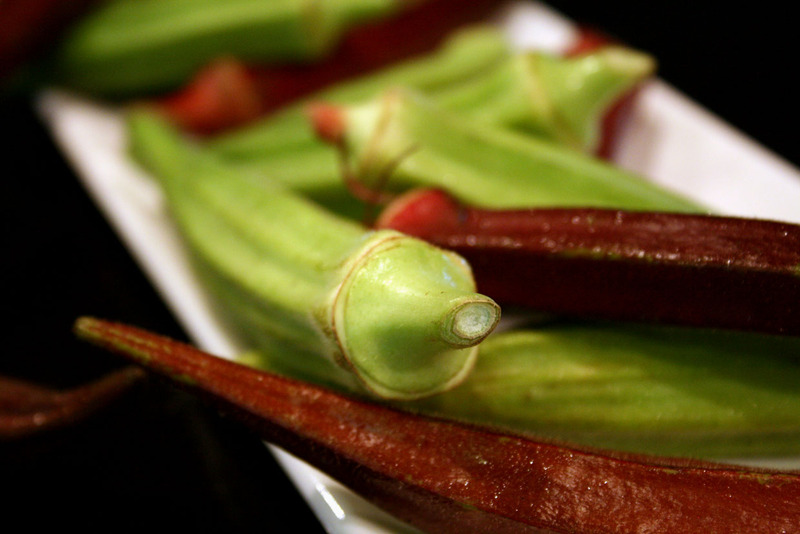 Can’t wait to see my Kath – and snack on some okra!! 😉 Soon! Our zucchini bit the dust this week. Just keeled over one day. But the ‘maters are coming in well and we should have some blueberries to pick in a few days. I can’t believe we missed Foamhenge when we were at Natural Bridge a couple years ago. SQUASH BUGS! Ouff. Natural Bridge is overrated. Foamhenge is the REAL natural wonder! We stayed at the Natural Bridge Hotel which looks nice but there’s just something weird about it. It’s like being in a BBC production. It feels like it should be upscale but it comes off as being really low budget even though though the prime rib dinner was 35 bucks a plate. I kept waiting for a Masterpiece Theatre title to appear. Hope you got the chance to check out the wax museum and caverns. That’s fifteen minutes of mediocrity you’ll never forget.